Emotions are momentary and spontaneous, which sometimes explode in an entirely bizarre manner setting of an unusual funny incident. Usually, seen on the verge of wedding events. The wedding which is not meant to be funny at all, suddenly transverse a wave of giggle among attendees. The incident pops-out as bride and groom conscious effort to entertain guests blows-up giving them a lifetime memento. Wedding bloopers are quite common, swapping heavy rituals with a funny gag. 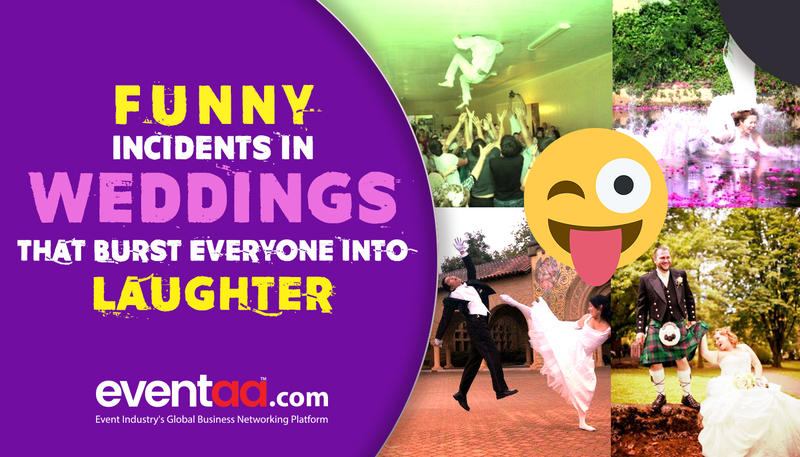 Here are some crazy wedding moments that blench guests with laughter and went viral overnight. Bouquet toss, a popular ceremony for unmarried women in wedding, sometimes appears as an elegantly executed MMA fight move. The lucky female catches the bouquet to get married next, but only after throwing herself into a hilarious “cat-fight”. But if you want more fun don’t miss out on the male version too. You rate dance as good, bad or worst but there is one rating reserved especially for wedding dance called “Terribly funny”. This performer you will find in every wedding tries to impress guests with their wobbling dance moves which are insanely funny, but unlike other dance, reality shows the performer over here collects a loud cheer “YOU GOT THE TALENT”. The wedding cake is just like a house of playing cards, and this layered cake needs precision in handling and cutting, otherwise what going to be your desserts of the evening soon be seen as a smudge on the floor. All the honour is on those shaky hands, who thinks he can handle both the whipped cream on the cake as well as the verbal whip that he soon be receiving after messing-up the delicious delicacy. Wedding vows are the serene moment where surrounding becomes sentimental and serious. But sometimes, in such tense moment, laughter breakouts as couple gobble words and does their own version which may sound wacky. Something similar happened here in this footage where bride goes uncontrollably after Groom messes-up with wedding vows. “Best man” job in a wedding is to cover the flaws of the Groom unless he decides to do something precious. This best man in the video was little distracted by the bride’s friend, and what happened next is a stunner. The late reflex action was too late for him to keep bride and priest hinge over the poolside. During a wedding, if someone slouches awkwardly then keep your camera aperture wide open because you soon going to capture some nerve-wracking moment. It could be the “balancing moment” for Groom, but for rest, it is one chance to relax their laughing jaws before they confront the Groom. This dedicated wedding photographer is so engaged in taking photos that he hardly realised that he caught himself at the dead end. The fiery wedding is not on the schedule, but you will have a taste of it if you have photographers of this calibre pushing you for a firing pose. Be prepared with fire drill if you are planning a photo-session with such blazing tips. Till the last moment of the event, host and event-planners experience a heavy toll. Intense moments, those small funny incidents relieve their stress to a certain level. If you have come crossed to such incidents while attending any wedding, then express your blooper-experience in the comments below.